Oral history interview with Orlando native Elizabeth Thornton Robinson, (Betty Robinson), at her home on Lake Conway, September 9, 2016. 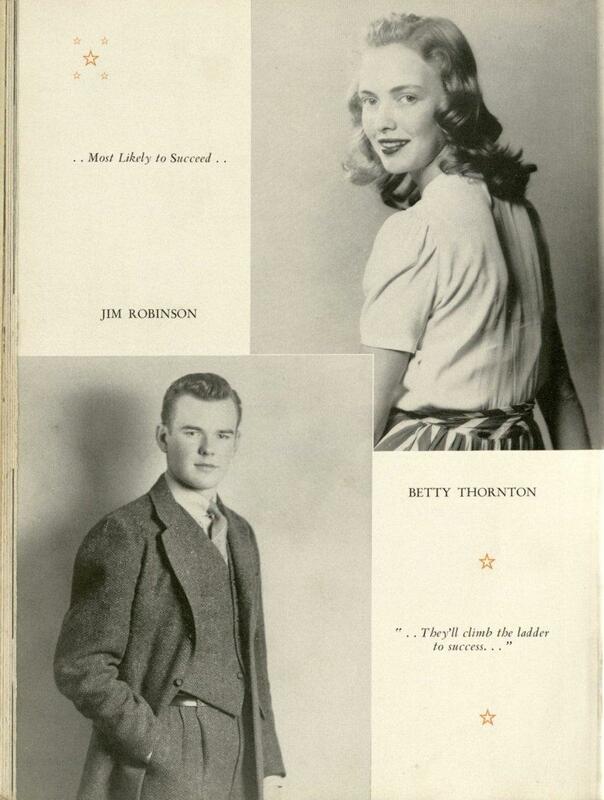 My name is Betty Robinson, at least that’s what I’ve been called all my life. I was christened Marie Elizabeth Thornton…. I married Jim Robinson and changed my name and took the Elizabeth and the Thornton and the Robinson for my name and that’s my story. I was born in Orlando in Orange General Hospital and the hospital has become Orange Memorial and then, well, I don’t know what else. Now it’s Orlando Regional Health Center. But there’s not a brick left that was there when I was born because that was 93 years ago. I went to kindergarten at the First Presbyterian Church. I don’t believe it was church sponsored but it was a church member who had the kindergarten there and she had it in a big Sunday School room. The one on the back of the old Sunday School building that had outside stairs going down to Palmetto Street. Her name was Mrs. Dovell… She was very well known and she had studied Montessori method. And she was a very, very good teacher. I have been grateful to her all my life because although I was five and it was kindergarten she said, “This child is ready to read!” And she taught me first grade and taught me to read and taught me very well which helped me later being a pretty good speller in my younger days. I went after that to Hillcrest Elementary and started there in the second grade because I had already had first grade. And years later, I discovered that in my class was a boy named Jim Robinson. But I do not remember him in my class. He remembers and we know it was the same class because he remembers my best friend, Corrine Smith. We were in the same class with the same teacher. But I don’t remember him. I remember another little boy. And, I finished at Hillcrest. We lived on East Pine Street and it was right on the line between Hillcrest and Delaney. And, well, Corrine lived over on Church and she went that one year to Hillcrest. But, I think after that, the line was drawn right down the middle of the street and she went to Delaney. I think I remember every teacher’s name. I had Miss Tischner second grade. I had Mrs. Reiser who was from Virginia and had a lovely accent. And when she read Uncle Remus, it was so real. And I got the book and gave it to my mother and she didn’t have a southern accent. It was not real at all. I had Mrs. Ware in the fourth grade, and Mrs. Table in the fifth grade, and Mrs. Kahn in the sixth grade and they were all remarkable teachers…. After that I went to Memorial Junior High which was then located on Lake Eola where later the Harley Hotel and various hotels were built and now it’s a condominium. I went there in the three junior highs as they’re called now. Actually, I lived halfway between Memorial and Cherokee. And they were not districted in those days. You could go where you wanted to. And my cousin had gone to Memorial and he just lived a block closer than I did. And my sister had gone to Memorial so I chose Memorial. Besides that, my grandmother lived on East Washington Street right across from the junior high and she had a small apartment house. And one of her tenants, who was a permanent tenant, Miss Hatabal Hyer, took the lunch money at Memorial. Another reason to go. Connections, connections. And we used to walk around the lake to go to school. And then, of course, nobody had telephones then. Even some of my family didn’t. But, if I wanted somebody to call my mother I went across the street to grandma’s house and called. And then after that, I went to Orlando High School which was, we always said, “It was the only high school. But it was the only white high school in Orlando.” And so, I knew a lot of people from Memorial and we merged with people from Cherokee.Well, Jim had gone to Cherokee and they were kind of a different crowd. I don’t know. I always called them a little snooty. But we didn’t date. I knew Jim and I was in activities with him. And we didn’t date until I asked him for a date at the end of our junior year. It was a girl bid thing. It was quite legal to ask him. And I think it was in his interview that I said I wasn’t going because I didn’t have a date. And his friend and neighbor said, “Why don’t you ask Jim Robinson” and that’s how that all began. But anyway, that’s my schooling up to the end of high school. We graduated together. He was the president of the class and I’d been secretary all three years of our class. So we led the procession because the two other officers were boys. 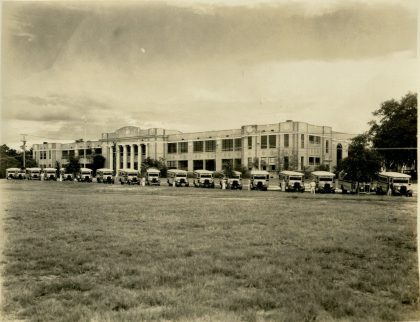 And in those days we did not where caps and gowns. We wore evening dresses and the boys wore coats and ties. And they were lucky if they had one. This is right at the end of the Depression. And so we then parted ways so to speak and did what girls and boys did if they went to a state school. Girls went to Tallahassee to Florida State College for Women and boys went to University of Florida at Gainesville. And you went to Tallahassee or you went to Gainesville. We didn’t bother with the names of the schools too much. And I went there and finished in three and a half years, but graduated at the end of my fourth year…. I knew my father would be brokenhearted if I didn’t graduate. So I begged and got to go to summer school that summer. I did everything needed and then finished up in January all but one course which I had taken- you couldn’t CLEP in those days, but you could take by correspondence from the University of Florida and it was in process. So, I finished by the end of the year and I actually graduated with my class in absentia. It was just too hard to travel in those days and you didn’t go back just to graduate. Well, we traveled by bus, Greyhound Bus. And that was not the most comfortable way to travel. We had cars, but they were old and we couldn’t get tires and we couldn’t get gasoline. This is real history. So you didn’t go from here to Tallahassee if you didn’t have to and by then I was married. When I finished the course work at Florida State, Jim by then had been sent back to the University of Florida in kind of a holding pattern because he was to go to Officer Candidate School. So we decided we’d get married a week after I graduated in February. February 4, 1944. A week after we were married, this is in his story [Oral History Interview with Attorney Jim Robinson]… we were married on Friday, had a two night honeymoon in Daytona Beach. He went back to the University of Florida and they said, “You’re going to Officer’s Candidate School….” and I went home to my parents. Because we had not established any home and I had not even got a job. So I went home to my parents who were happy to have me. They were good parents and my sister was still at home. And I got a temporary job. I worked at the Fort Gatlin Hotel as a bookkeeper. It was a nice hotel… traveling people came. And some people came for the winter. And it had a restaurant where you could get a meal for less than a dollar, you know, in those days. And I think I ate for free at noon. It was a nice job. I had a friend who had not gone to college and she was working the switchboard and that’s how I got the job. And so, I stayed there while Jim had three months of Officer Candidate School. And then he said, “Well, you can come out here and I can see you a little while everyday.” So I gave up my job and packed off to Fort Sill…. And so he found me a room. You didn’t find apartments. Lawton, Oklahoma, was a little town with a very nice couple who were very good to me. They had a little two bedroom, one bath house, modern, but they were very nice. They were like parents and I was twenty years old. I would walk down the main street and hop on the bus to the Officer’s Club and wait until he got through eating his dinner. And then we would visit for an half an hour. And then I would hop back on the bus and go back to my single room. I volunteered there at the library. I guess through the Red Cross, Grey Ladies. And they positioned me there in the library and I could take out all the books I wanted. Well, to go back to my college days, my good friend, Alice Price who had hooked me up with Jim from the beginning, and her friend, Eleanor Yothers, were my two mentors ahead of me in high school. The two that admired very much. And they both had joined Pi Beta Phi Sorority so I, of course, joined that, too…. it was a very good experience that has paid back all my life. We had to do activities. We were required to have activity points every week which meant we had to do something on campus. We volunteered for the Red Cross. We knitted for Britain and we did various things. Went to Senate meetings on the campus. And, I guess, if we went to a legislative meeting that was a big plus, but they weren’t in session too long. And it started me volunteering. And so, when I got married and had nothing to do I volunteered. Later after he finished OCS he had another course to do as an officer. I think it was in communications, I’m not sure. So we rented a house then from somebody whose husband was somewhere else and she went to join her husband and we rented the house for three months. And I had never stayed alone at night. Unbelievable, but I learned because he would have problems overnight. And I would bring home books from the library and I would read until I fell asleep. Thank the Lord for the library. Well, after three months, we came home for a leave and had a terrible hurricane in 1944. Didn’t bother us much. We were still kids. I’d turned 21 and he was 22 by then. But we were staying at his parents house and a tree fell down outside our window and we never heard it. His mother was without electricity maybe two weeks during the war. There was nobody here to reconnect. And she had an electric stove. And she worked herself crazy trying to cook things over the fireplace and go to a friend’s house and cook while I was there. I was young. I didn’t realize. I hadn’t really kept house much then. So we went back to Fort Smith, Arkansas and he was stationed at Fort Chaffee where he then joined an outfit because he was then trained. And they were getting ready to go overseas or go into the war…. 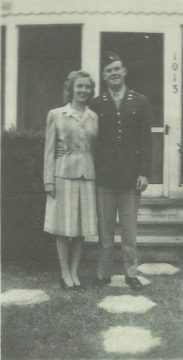 So he was off and they went to California to learn to land large guns, artillery guns from landing craft for the invasion of Japan. And they no sooner got there then the Battle of the Bulge broke out… and they took them and put them back on a train and took them to the Atlantic coast and they landed in [Europe] in the middle of winter… and I didn’t see him again for a year and a half. And in those days we didn’t have cell phones. He made one call after the war was over by making an appointment and I think it cost $14.00, which was an item in those days, for maybe three minutes. But that was after the war was over. Well, he got there the first of the year, January or February. The war was over in May and people began to be discharged. But you had points. How long you’d been overseas, how many children you had. So, we didn’t have any points and so he had to stay a little more than a year after that. So, I had another job. I worked for American Machinery Corporation. At that time it was the manufacture of food processing machinery especially citrus. And they made machines with brushes and scrubbers and made wax to wax the fruit. But they also at that time made bomb casings. They had a plant in Fairvilla to make bomb casings. Well, they finally had a reduction in force I guess after the war ended and I was part of the reduction in force. And I got a job at the Air Base in civil service. And I can’t believe it, but I was a clerk typist; because my fingers don’t type at all well now. I make too many mistakes. But anyway, that was my bread winning and, of course, I was back with my family as was my sister who had gotten married in the meantime and her husband was in the Pacific area. So I worked there… until he came back in July of 1946. While I was there after one year working at the furniture store, a friend helped me get a job at the College of Education. And he not only helped me get a job, but he arranged for me to take courses while I was working. And I got more money than I’d gotten at the furniture store because he knew the dean who hired me. And so, I was looking for a job to teach [in Orlando] and went back to Memorial Junior High and Orville Davis was the principal and he was a wonderful man. But, he’d been my principal when I was in school, too. And he’d gone off to war and come back. And so, he hired me and I taught math…. I taught there three years. The year I went was the year that Pine Castle School closed its junior high section. It had gone to eighth grade before then. And so, the Pine Castle children and teachers were distributed to Cherokee and Memorial. After that, well, of course, I did a lot of volunteer work in the church. I taught in the Sunday School. I was a Circle leader and taught in my Circle for years and years and years. [What’s a Circle?] Our church was divided, the women were divided into Circles. And you had a group of women who met once a month and you had a Bible study and social time. And it was a very big part of the Presbyterian Church at that time because women were not ordained as elders, or deacons, or ministers. And so, well, the power in the church was the women. They did all the little jobs and it was a very powerful organization. It’s gone by the board now. Women can be ordained as deacons, elders, ministers. So, the leadership is gone from the women of the church. 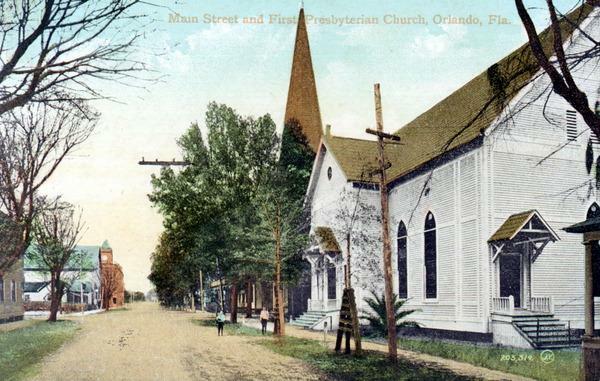 The First Presbyterian Church on Main Street (now Magnolia) at Jackson. Looking north you can see the red brick Orange County Court House (built in 1892) in the distance on the left. He was the auditor, probably call them comptroller now, for the gas company. And they serviced the city with gas and the surrounding area with electricity which sold out to Florida Power. 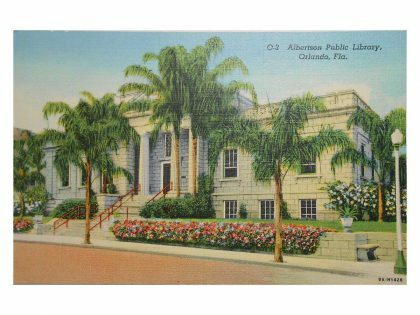 So he would go all around this area to Lake Wales and Winter Haven and various places where they furnished electricity. So, he had a pretty responsible job. But, it was sold in 1941; he was out. And, early retirement was not anything you heard about then. People stayed in the job forever and ever, you know. And, it was pretty hard on him. But, then came the war. Well, the war came about the same time. And then came the civil service and they got a very good man. And he worked out at the air base until he was 70. I’m sure he did a very good job. They all liked him and they were very happy with his being there because he was very good with numbers and could remember them, too. He kept score at the softball games for the Orlando Amateur Athletic Association and we used to like to go with him because we didn’t have a lot of spending money. And if we went we’d get a bottle of soda pop. And besides that, the bat boys were cute…. and there wasn’t much to do in Orlando in the summer anyways. So, he was always busy. He was a fisherman… early on in my life I remember going to Lake Apopka with a picnic when he was fishing. But after that he only went saltwater fishing and he’d go to Sebastian Inlet every full moon…. And he almost always – if the fish were running – he caught. And he’d bring them home. I guess he gutted them there. But he’d bring them home in his ice chest and set up the wash bin in the back yard and clean all his fish…. And he would clean them and filet them and give them away to whoever which was kind of nice in those days. People were glad to get a meal. And if he couldn’t take them away right away he would take them to the ice plant which belonged to his company. They would keep them at the ice plant. We didn’t have freezers in those days either. So there the company made gas on West Robinson out of coal. That property is now contaminated because whatever was left went into the ground…. My mother was a stay at home mom. She was always active in the PTA. She was not very aggressive. She was President of the PTA at the school where my sister went, Magnolia School. My sister went there second and third grade. But then they closed it and later it was an adult ed school, a vocational school. But they condemned the building for children. She was the PTA President there. She was always a room mother and she did her job. She was the kind of person if she was supposed to visit every mother in the class she did and tried to get them to join the PTA and she was always there. We went on field trips. We didn’t have school buses, parents drove. She was the one who drove to the Sunday School picnic. She drove. She was always there. She made a lot of our clothes, mine particularly well. Well, she did for both of us. But I danced. 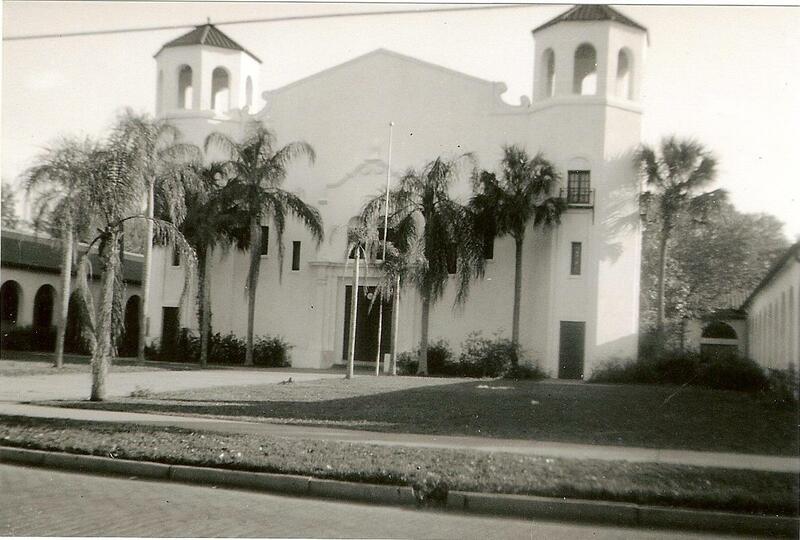 I went to the Ebson School probably around 1930-31 and danced with the Ebson dancers in their recitals until 1940. And she made all my costumes. We didn’t buy costumes in those days. We didn’t buy leotards. We didn’t buy scarves to float around. Mrs. Ebson designed the costumes and put the material aside at Slemons store on West Church Street. And you went and bought the fabric and made them yourself or paid somebody to make them. And she made all of mine. She was excellent. Well, her mother was a dressmaker that’s how she supported her family. Mother helped her until she had children. She really served a fine seam. And she took those costume patterns and, you know, it would be like this… no size. But she’d make them fit. She’d make hats. She’d make whatever I needed and she made a lot of my clothes. I was fortunate. In high school if I wanted a party dress, or an evening dress, she bought the fabric and made it. She put buttons all the way down the back or whatever I wanted. And she was a great mother. She liked to have a good time… she liked to go to the beach and she liked to swim. The lakes were not very good in the summer. We didn’t know about that amoeba, but you just didn’t go in the lakes in dog days you called them. The middle of July to the end of August. And, she’d say, “Well, let’s finish up and go to the springs…” So she would load up the car with us and a couple of neighbors and we’d go to Rock Springs or Sanlando. You had to pay to go to Sanlando: 35 cents… But they had a pool and a bath house and down the walk was the spring with a pool. 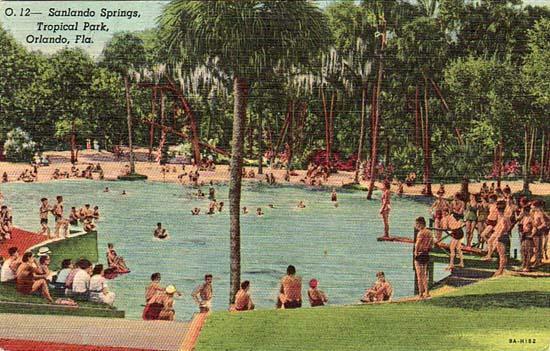 And Rock Springs, Rock Springs was there, too. And we asked Sally Downs whose husband developed the Springs about Rock Springs and she said, “It’s still there it’s just a little water coming out of a rock.” It was not worth running. A couple in our church ran it for a while. They didn’t own it. But they ran it and that was very popular for church picnics and church outings. What have you enjoyed most about living in Orlando? Well, I love the library. My grandmother lived on East Washington as I mentioned and I could read when I was five. But I couldn’t get a library card. And I just longed for my library card. And I remember when I was six I immediately went down and got that little blue card that said I could take books out. My sister had one of course and she was a couple of years older and we could go to the library from grandmother’s house. And in those days it was safe to walk, even little girls. And my mother would take us to the local library. Ms. Stewart was in the Children’s Department and she was a great storyteller. She would go to the schools and tell stories…. When I graduated to the adult department, I would, I guess in high school, I started to read all the novels… but I was always a reader. Later, I loved gardening after we had a home and a garden… I sewed. I knitted. I volunteered. I cooked. I was a pretty good cook. We entertained a fair amount. We had 57 of my mother’s friends here when she had a birthday. My sister and I did. All from Westminster Towers. She didn’t invite anybody else. And she brought the ones that had the hardest time getting here. She drove them herself. I think it was her 87th birthday… And he had a committee meeting here one time, church group national board. And I had them for dinner and I think we had 37. And I did the cooking. You know, we did a lot of that. And I enjoyed it. I had help. I had help to keep the house clean and also to clean up after me while I was cooking. It helps. But we’ve had some large parties. And we have a wine cellar and we’ve had some really good parties there. We had some ethnic parties there. Everybody contributed. We had Italian food. We had a Spanish one, and we had an earlier one, a smaller one, a French one. And I think that’s about all we ever did. Oh, and we belonged to the sommelier guild and went to wine tastings when he was very interested in wine and met people there that became part of our ethic group. So I just enjoy doing things…. 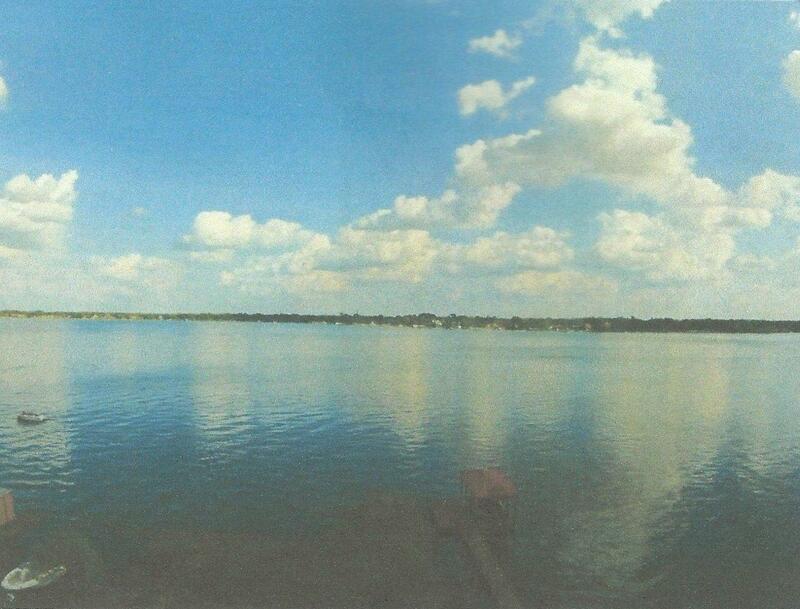 Place: Mr. and Mrs. Robinson’s home on Lake Conway. Oral history interview with Orlando native Elizabeth Thornton Robinson (Betty Robinson) at her home on Lake Conway, September 9, 2016.